New to DVD this week is John Patrick Shanley's "Doubt" (see review below). Another even better film about doubt is "Shadow of a Doubt", a mid-career Alfred Hitchcock classic about a small town teenage girl's discovery of her Uncle's heinous past of crime and corruption. I’ve always thought Hitchcock’s B&W films were his best, and this early Hollywood crime mystery is certainly one of my favourites. 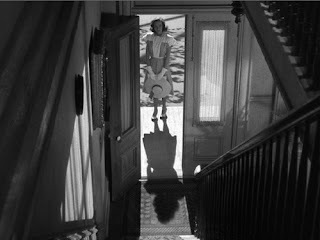 “Shadow of a Doubt” fits in the Hitchcock oeuvre as one his small scale ventures, like “Psycho” or “Lifeboat”, or “The Lady Vanishes”. In the quaint Californian town of Santa Rosa lives the Newton family – mother Emma, father Joseph, two young kids Ann and Roger and their teenage daughter Charlie (Teresa Wright). Charlie is named after Emma’s brother Uncle Charlie with whom the younger Charlie seems to have a special connection. When we meet Uncle Charlie (Joseph Cotton), he's a shifty citydweller wanted by the police for some unidentified nefarious activity. On the run he decides to escape to Santa Rosa for a surprise visit to the Newtons'. Immediately the young Charlie is smitten with her handsome and big city exotic Uncle who arrives with lavish gifts. But as she attempts to get to know him, her prying questions are met with diverting white lies. Uncle Charlie can’t pull the wool over young Charlie’s eyes as she quickly reads through his deceptions. She thinks nothing of it, other than humble privacy, until two investigators come snooping around the town looking for a wanted murderer. With this ‘shadow of doubt’ in her mind, her idealized love for Uncle Charlie comes crashing down, especially when she finds herself the next target for his violent nature. Uncle Charlie is one of Joseph Cotton’s great performances. Cotton is perfectly cast according to his likeable warm qualities he established in his two Welles performances ("Citizen Kane" and the "Magnificent Ambersons"). And so, even when Uncle Charlie is at his worst the ‘shadow of doubt’ that he is innocent always remains. We barely get to know Uncle Charlie’s motivations, only partially revealed in Cotton’s great dinner table speech – an angry rant which reveals his latent misogynistic disgust of widowers. It suggests a complex backstory of pain which corrupted a once optimistic and gentle man. Of course, it’s never all-too serious in a Hitchcock picture. His trademark black wit is provided by the wonderful performance of Hume Cronyn as Herbie Hawkins, the crime novel enthusiast who banters with father Newton about the best ways to bump someone off and get away with it. It’s one of Hitch’s pulpiest films as well. The actors express themselves with exaggerated performances. Cotton’s mysterious shiftiness, Patricia Collinge’s nave matriarch and Teresa Wright’s dramatic emotional shifting hit home the story beats as forcefully as Hitch has ever had them hit. But the larger-than-life performances aid in Hitchcock’s theme of suburban Americana. Much is made of investor Graham’s subterfuge as a journalist doing a story on ‘the typical American family.’ Uncle Charlie represents the poisonous influence of big city crime into the wholesomeness of young Charlie's utopia. Of course, the film was made during WWII, and before the suburban post-war sprawl which we would see in the 50’s. So, in many ways, this story is a decade ahead of its time. Hitchcock’s daughter Patricia has said “Shadow of a Doubt” was her father’s favourite film. It’s definitely one of his most complete. We all know he is a master of the dramatic set piece, and indeed there are some great individual scenes, but the strength is an underlying tension which is sustained throughout the entire film and the emotional destruction we witness of young Charlie’s idyllic and sheltered optimism of the typical American family. Enjoy.